Richard is the founder and owner of Appraisal360. It was during his career as a Chartered Engineer in the telecommunications industry that he had his first experience of 360 degree feedback and was an instant convert. He decided to bring together his experience of designing and operating online information systems with his interest in leadership and personal development. 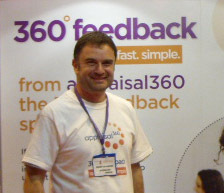 And so Appraisal360 was born in February 2006. Richard strives to make the world a better place – and with Appraisal360 he hopes to make people’s working lives that little bit more fulfilling and rewarding. He believes passionately that tools are there to do a job, and not the other way around, so simplicity, clarity, flexibility and robustness have been built in from day one. Lynda co-ordinates Appraisal360 Practitioner activity, managing corporate projects and supporting clients requiring services beyond our online 360° feedback tool. Services to clients include overall project leadership, management of training and development and feedback facilitation for client organisations and private client coaching. Lynda is responsible for the training and development of our Practitioner Network, areas include project management, 360° feedback facilitation and identifying organisational learning. Lynda is an expert in supporting coaches & trainers to develop their business using 360 feedback and following the success of her latest book ‘Get Out Of Your Own Way’ offers a range of development programmes and mastermind groups to ensure the best coaches & facilitators are working with Appraisal360. Tom has over 15 years experience developing software and web applications, and is passionate about delivering simple but effective software. After graduating with a degree in computer science, Tom worked with a variety of medium and large companies across the UK and US on large-scale database applications. Tom joined us in 2007 and has since been responsible for developing the Appraisal 360 application and administering our servers.